One of the charges leveled against God by unbelievers is the question of why a loving God would send anyone to hell. A corollary to that questions why God would send sinners to hell since He created them that way in the first place. Unbelievers are not alone in this camp. They are joined by many pseudo Christians, like those in the Emergent Church movement who would do away with the doctrine of hell altogether in their misguided effort to rescue God from such charges, and thus make Him more attractive to the masses. The truth of the matter is that God sends no one to hell. Hell was not intended for man, but rather it was “prepared for the devil and his angels” (Matthew 25:41). From the beginning of time when man fell, God has always been proactive in the restoration of the broken relationship between God and man. When man first disobeyed God, God immediately reached out to man in an effort to reconcile the broken relationship. “And the LORD God called unto Adam, and said unto him, Where art thou?” (Genesis 3:9). Does anyone really believe that God did not know where they were? David says, “Whither shall I go from thy spirit? or whither shall I flee from thy presence?” (Psalm 139:7). God knew where they were. He gave them the opportunity to come forward and confess their disobedience, but instead they made excuses: “I was afraid, because I was naked; and I hid myself” (Genesis 3:10). Again God gave opportunity for confession: “And he said, Who told thee that thou wast naked? Hast thou eaten of the tree, whereof I commanded thee that thou shouldest not eat?” (Genesis 3:11). Of course God knew what they had done. He was present when the serpent tempted Eve. In fact, Satan could not have tempted Eve without God’s permission (See Job 1-2). Just in case you are thinking it unfair of God to put Eve through such a test remember that “God is faithful, who will not suffer you to be tempted above that ye are able; but will with the temptation also make a way to escape, that ye may be able to bear it” (1 Corinthians 10:13). Adam and Eve had all of their needs met. They wanted for nothing, yet they chose to disobey. But it was God who opened the door for reconciliation. From the beginning God initiated the plan to reconcile man to Himself. “I will put enmity between thee and the woman, and between thy seed and her seed; [He] shall bruise thy head, and thou shalt bruise his heel” (Genesis 3:15). God’s solution was to take “upon him the form of a servant, and was made in the likeness of men: And being found in fashion as a man, he humbled himself, and became obedient unto death, even the death of the cross” (Philippians 2:7-8). Such extreme measures were necessary because He is “not willing that any should perish, but that all should come to repentance” (2 Peter 3:9). That being the case, after all that effort on His part, why would He send anyone to hell? As can be seen by the example in the Garden of Eden (Genesis 3), it was not the sin of disobedience that brought the curse, but lack of contrition on the part of the guilty couple. God gave ample opportunity to confess, assume responsibility, and ask for forgiveness, but instead they offered up excuses. If our sin kept us from being reconciled to God, no one would be saved “For all have sinned and come short of the glory of God” (Romans 3:23). But God has provided the solution to the rift that exists between God and man. Jesus said, “I am the way, the truth, and the life: no man cometh unto the Father, but by me” (John 14:6). For this reason He said, “Verily I say unto you, All sins shall be forgiven unto the sons of men, and blasphemies wherewith soever they shall blaspheme: But he that shall blaspheme against the Holy Ghost hath never forgiveness, but is in danger of eternal damnation” (Mark 3:28-29, emphasis added). To “blaspheme against the Holy Spirit” is nothing more than rejecting the message of salvation that the Holy Spirit brings to every individual. What is that message? “Believe on the Lord Jesus Christ, and thou shalt be saved” (Acts 16:31). “That if thou shalt confess with thy mouth the Lord Jesus, and shalt believe in thine heart that God hath raised him from the dead, thou shalt be saved. For with the heart man believeth unto righteousness; and with the mouth confession is made unto salvation” (Romans 10:9-10). Reject that message, and it is not God that sends you to hell. At that point, you have rejected God and His offer of reconciliation, so He has no other option but to say, “Depart from me, ye cursed, into everlasting fire, prepared for the devil and his angels” (Matthew 25:41). You don’t go to hell because you’re a sinner, but because you have rejected God’s offer of salvation. If you are unsure of your eternal state and are still conscious and breathing, there is hope for you. You have two choices: God or no God. Just remember, whatever choice you make, it is for eternity. If you choose God, He says, “Then shall ye call upon me, and ye shall go and pray unto me, and I will hearken unto you. And ye shall seek me, and find me, when ye shall search for me with all your heart” (Jeremiah 29:12-13). 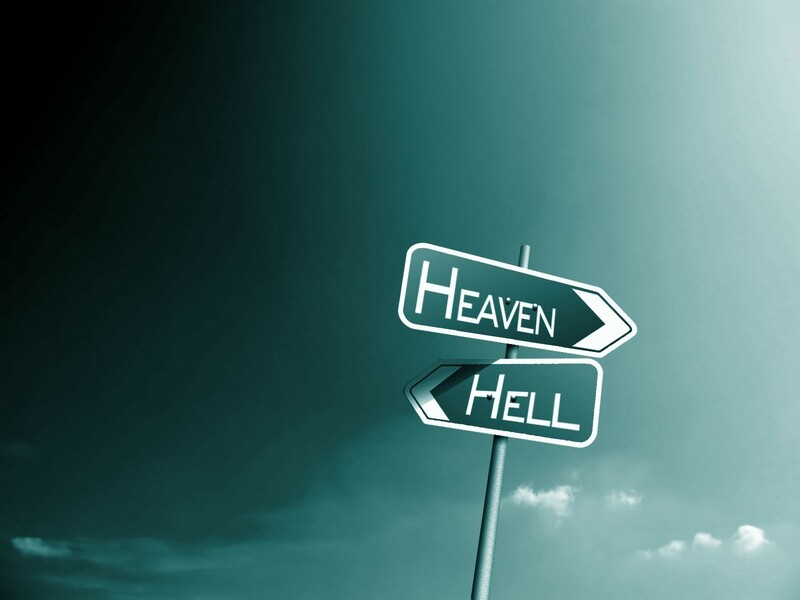 Sin won’t keep you out of heaven, but the wrong choice will.